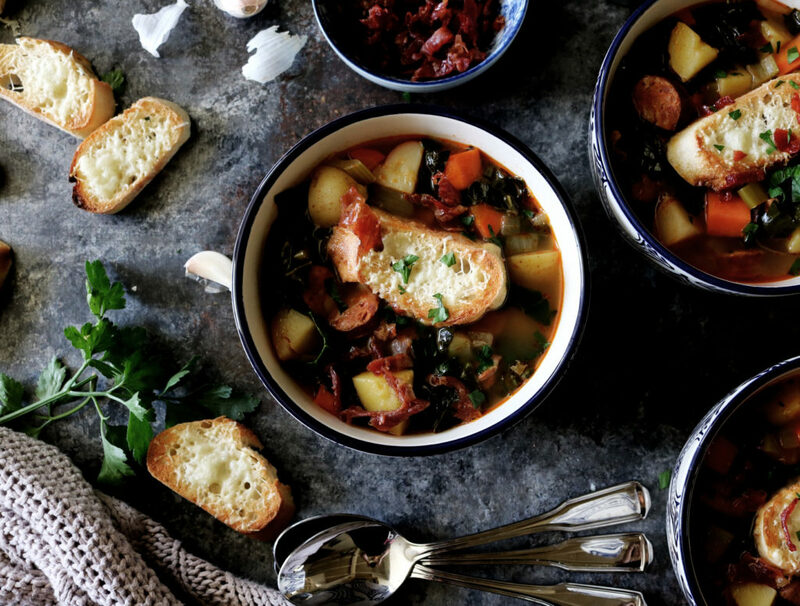 I wanted to create a soup that was Caldo Verde adjacent, with potatoes and kale and sausage, but I wanted (NEEDED) more of a clear soup rather than creamy. So I set out to use all of the key Caldo Verde players: Portuguese sausage (I offer several substitutions below if you can’t find it), loads of kale and potatoes. Then thoughts of crispy prosciutto and manchego and carrots and garlic danced in my head and then this Portuguese soup just basically made itself. I sat on the couch, martini in hand and just waited for it to be done. I took a quick catnap, caught an episode of Bob’s Burgers and boom. It was fast. And I felt satiated. And calm and at peace. Utter comfort that only soup can induce. Meditation and yoga need not apply. If you want to get really zen about life make a pot of soup. Wear some thick socks. Ignore your text messages. Be nice to yourself. Turn on football even though you have no idea what’s going on. Or, maybe you do. Regardless, this is what fall weekends are all about. Are you with me? Sausage. You can use linguiça (LOVE), Spanish chorizo or perhaps even andouille sausage. What you’re looking for is a hard sausage (yep), not the kind you take out of the casing and crumble up. You’re also looking for a sausage with a bit of a kick….some fun spice to keep you warm and toasty. Kale. If you don’t like it, use collard greens or even spinach. Smoked Paprika (Pimentón). I use this really gorgeous paprika from The Spanish Tin. Use what you have, but I strongly suggest investing in a really nice jar of paprika at some point in the near future. The flavor is unreal. Carrots. I always cut my carrots in a large dice, bigger than all of the other veggies so that they don’t get mushy. I can’t stand that. Take note. Prosciutto. What’s not to love about crispy prosciutto? I could probably find a way to put it in every meal…snack on it like popcorn. To cut, I like to roll it up like a cigar and thinly slice. But you do you. If you’re not feeling it, you could sub in some bacon…the always acceptable substitute for everything according to anyone that has their wits about them. Manchego Toast. You haven’t lived until you’ve made this magical toast. Bread is first rubbed with garlic, sprinkled with finely shredded manchego and then does a quick stint under the broiler. Float said toast in your Portuguese soup, until it’s underbelly gets perfectly saturated with smokey broth. I could be pious and tell you that each person needs just one toast, but I’d be lying. Two per person? Kidding. Three, three’s a good number…but nobody will judge you for five. Yep. Five toasts. That’s the number. The Next Day. There is something truly transcendent that happens to soup (or chili or any stew) overnight. This will just get better the next day and the day after that. The gift that keeps on giving. This is a meal I can get behind. 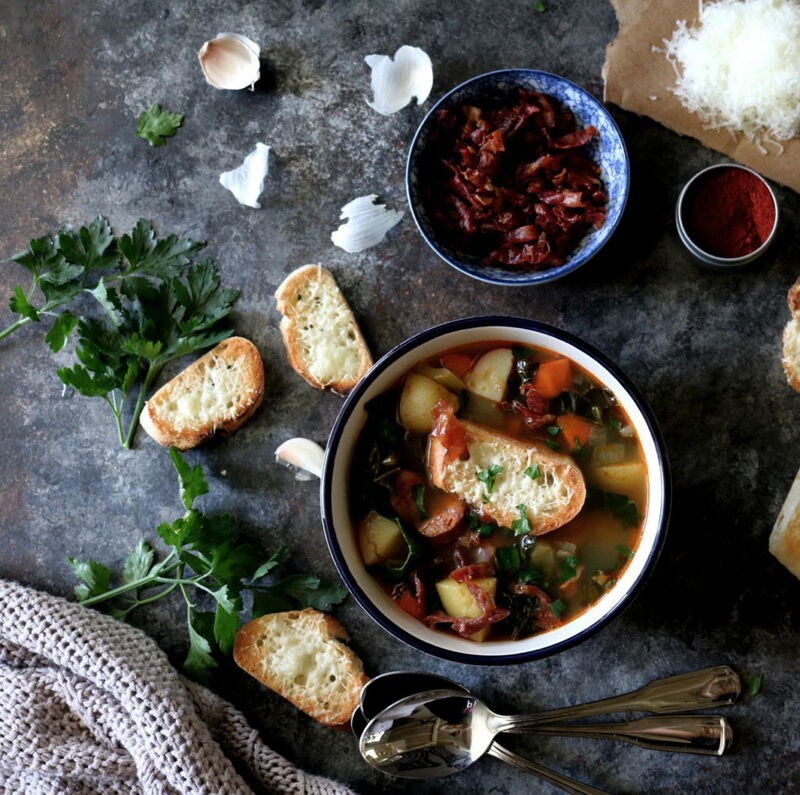 Let’s make some Portuguese soup, shall we? Put a large heavy-bottomed stockpot* over medium-high heat. Add the olive oil and once it’s all hot and shimmery, add the prosciutto and cook until it’s nice and crispy, about 4-5 minutes. Use a slotted spoon to remove it from the pot and set it on a couple layers of paper towels. Add the chopped linguiça to the pot and cook until it gets nicely bronzed and starts releasing some flavor juices, about 5 minutes in. Yep, flavor juices. Lower the heat to medium and add the onions to the linguiça. Cook for 5 minutes until soft and they’ve turned a nice, exciting reddish hue. Stir periodically to keep the onions from burning. Add the garlic and cook for an additional 60 seconds, stirring continuously. Put the paprika in the pot and stir to coat the meat and veggies. Add the carrots, celery, chicken broth, bay leaves, potatoes and manchego rind to the pot. Scrape the bottom to release any flavor bits. Turn the heat to high and bring the soup to a boil. Once boiling, add the kale, reduce the heat to a low simmer and cover. Cook for 30 minutes or until your potatoes are soft and easily pierced with a fork. Taste your broth. I added 3/4 teaspoon each of sea salt + cracked pepper and it was perfect. Let your palate be your guide. Just prior to serving, turn the broiler on in your oven. Place the baguette slices on a baking sheet. 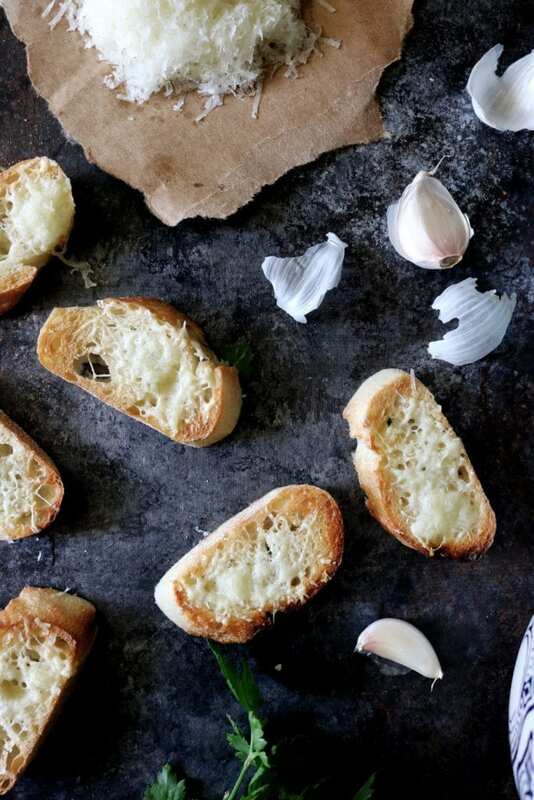 Rub the cut garlic clove over the bread slices and sprinkle the grated manchego over the toast. Put under the broiler for 30-60 seconds (watch the whole time!) until the cheese is melty and the edges are George Hamilton bronzed. To serve, load up your bowl with a ton of Portuguese soup, nestle your toasts in the broth and sprinkle AGGRESSIVELY with crispy prosciutto. Add the chopped parsley if you want some jazz hands. Several bowls of my soup may or may not have received an extra handful of shredded manchego dusted over the top. Just saying. Be sure to tag me @displacedhousewife #displacedhousewife so I can see your Portuguese soup!! *Make sure it has a lid for later in the recipe! If you need me, I’ll be eating + drinking my way through each of these beautiful places. Prepare to question your intuition while you play Can You Spot the Liar. How did you fare? Food for thought on being a bystander. I have tickets to go see the Nutcracker in San Francisco and I can’t wait. I know I’ve been all pumpkin and apples…but I’m starting to get the peppermint and gingerbread feels…just preparing you. More Soup: Cauliflower Soup, Mexican Tomatillo Soup, Dirty Baked Potato Soup, Cheddar Corn Chowder and White Girl Mexican Soup. More Fall Recipes: Slow Cooker Spiced Apple Cider, Spiced Apple Cake, Spiced Pumpkin Chocolate Chunk Cookies, Petite Pumpkin Scones, Pecan + Tart Cherry Granola, Giant Chocolate Chip Cookies (one of my favorites! ), Fresh Fig + Pecan Fall Salad, Thai Thai Scones and Breakfast Crack Cookies, Maple Oat Scones, Harissa Steak Chili, Pumpkin Gnocchi and Dark Chocolate + Espresso Babka. PS I realize I’ve been using the word ‘spiced’ in a lot of my recipe titles lately. Can’t stop, won’t stop. Oh, and this is my attempt at a meal planning post for the week. Because it’s quick and tasty! Making it right now, everything is smelling so good. working full time. Husband just lifted. Both serve our country. Hi! Trying my hand at this soup right now, just realized the recipe doesn’t indicate when to add the kale.. when should that happen? Thanks! yoga schmoga. i’ll meditate over a big bowl of this soup all day long. you had me at aggressive prosciutto. LOL – you use spiced, I use smoked! We just cant help ourselves! The flavors of good quality spices – oh MY!! 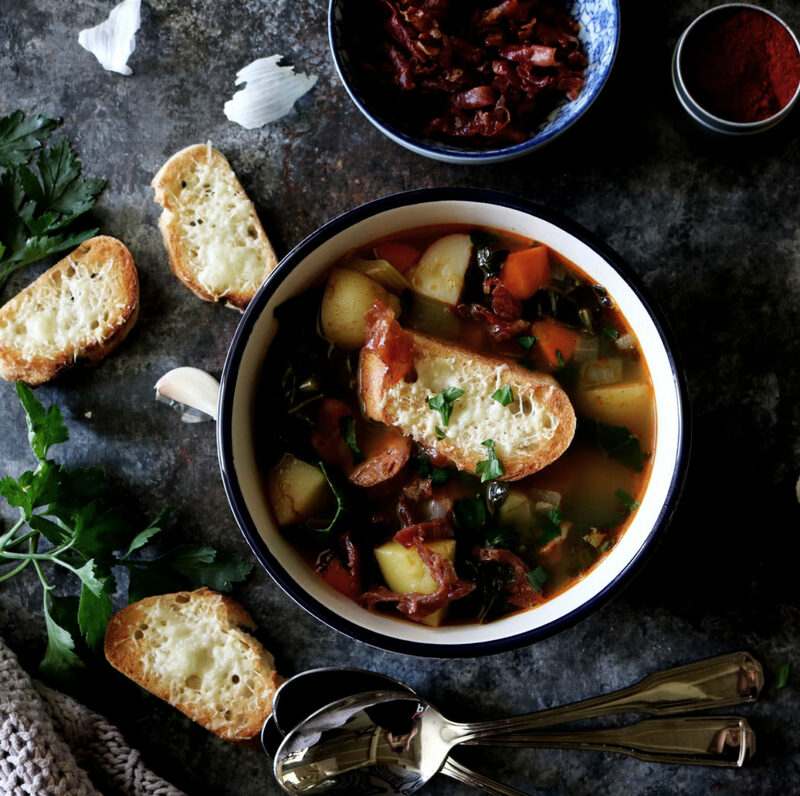 Love this clear soup, Rebecca and I agree, a good tin of paprika is a must! I freak out when I run out! Love it so much. Delicious work my dear and I spy a new back board? It rained more than 2 inches here over the weekend, and all I’m craving is soup. 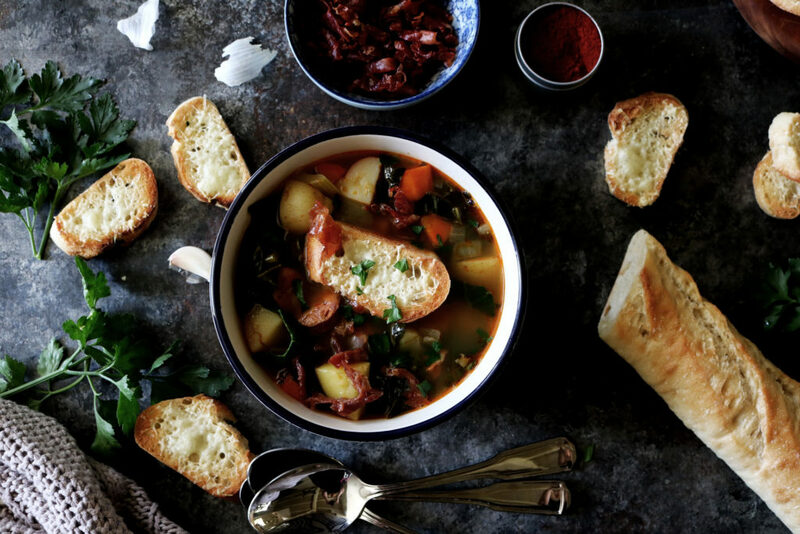 Plus you served these bowls of comfort with Manchego toast – this is why we are friends ;). I am loving that this soup tastes even better the next day. Sundays are all about meal planning for me and I try to make recipes I can easily double so I can eat them for lunch too. Love this…and those manchego toasts? OMG!